“Dear journal, I dishonored my loyalty towards my friends. Remember my last post about sage? No? The Friday posts, remember? Ouff! You are slow on the uptake, aren’t you? Ok! To sum up I will say that I promised a recipe, which is my new take on pesto using sage and lemon zest, but failed to deliver it on time. I am unforgivable! What? You think that I should shut up and continue on with the recipe and they might forgive me? You think? Fine, fine I’ll keep it quiet. Pluck the sage leaves and put them in a blender with garlic, pine nuts, parmesan cheese, the zest and the juice of he lemon. Blend until smooth. With the blender running add slowly the olive oil until it looks like a thick paste. If you like your pesto a little lighter in texture you can always add more olive oil. Season to taste. Keep in the fridge. Cueillir les feuilles de sauge des brins et mettre dans un robot ménagere ave l’ail, les pignons de pin, le parmesan, le zest et le jus du citron. Mixer jusqu’a ce que le mélange devienne homogène. Avec votre robot en marche, verser doucement l’huile d’olive pour obtenir une purée assez épaisse. Si vous aimez votre pesto plus leger, en terme de consistence, vous pouvez toujours rajouter plus d’huile d’olive. Assaisoner a votre goût. Garder au frigo. I have huge sage plants in my garden, and this looks like a wonderful recipe for my fresh sage. A question: when you say three sprigs, how much is that in terms of tablespoons (or some other measure)? My sprigs would be very long at this time of year! Rose, you are so forgiven - this looks wonderful! I never thought it would be possible to make pesto with sage. Wonderful! My sage plants are just beginning to grow. Glad you honoured your promise Rose! Lovely. Sage is one of my favourite herbs, and you have used it here so well! For you Rose, I'll wait. Thanks so much for this one. At least a little bit of all that sage growing wild in the back yard will now find some happiness in a little jar and find it's way into our lives!! Kudos!! 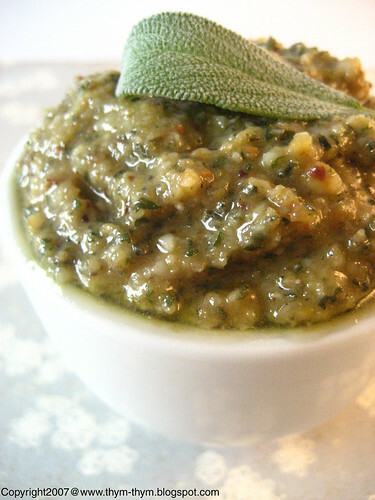 I would never have thought of making pesto with sage, but WHY NOT!!! !I bet it is delicious with chicken!! It was worth the wait. 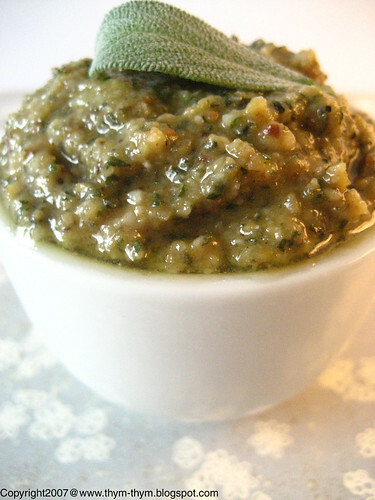 :-) I never thought of using sage in pesto. What kinds of meat do you think will go well with this pesto? I was wondering what you have been eating the pesto with-I would think it might be a little strong to dump all over pasta-or does it taste good that way? 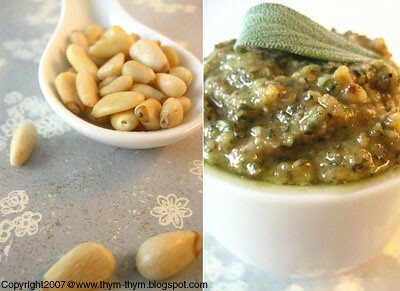 - Thank you very much Patricia for your kind words.It is a spicy pesto using sage and lemon zest. - Marion, tu devrai vraiment essayer. C'est tres bon. Moi aussi, j'ai gouter la sauge pour la premiere fois il y'a 4mois seulement. - Lucy,give them a little bit of time to grow then try this recipe. You will love it. - Thank you very much Tanna. I hope you will enjoy it. - Valli, at first it was just to try and now I love it as it has a richer flavor. - Nora, I had it with grilled chicken kebab and vegetables and had it also once with potato gnocchi and it was lovely. It might work as well with grilled lamb chops and pasta but in small amounts. If you do try my brownie, for some reason, you will notice that it tastes better the following day. Try to keep it in a box covered with wax paper or baking paper. It will keep its moisture this way. Have a great weekend Nora. - Nikki, it was my first experience too. Hope you will like it. - Lyra, I had it with potato gnocchi, with grilled chicken and vegetables. It woeked with pasta too but don't dump all over like you would with basil pesto as it is stronger. The lamb shop seems like a great idea. Thanks for your visit Lyra. I remember that Friday LOL. I read through the recipe but I can't imagine how it must taste could you maybe describe it a little. Is a lot like basil pesto or is it so strong with sage it taste like thanksgiving stuffing gone mad. Hello there Shayne. Don't worry it doesn't taste like thanksgiving stuffing gone mad. It's spicy, nuttier and with the zing of the lemon zest that freshens evrything. This looks like a great summer dish! I've got tons of sage in the garden and I don't use it nearly enough, this looks great! Rose, we should get together sometime for lunch. - Glad you like it Brylinn, you should really try it. - Shayne, that's a great idea. You have my e-mail. Tell me what days work best for you and where and we will plan something nice together. I am so glad you posted this! It sounds delicious and the sort of thing I love to cook. Thanks for this recipe! I love sage and find it's usually all too often overlooked in cooking. - Truffle, I am glad you like it. - Aimee, I agree. but it is a very subtile herb when used correctly. - Ivonne, thank you very much.